RESIDING at Calvary Haydon Retirement Village in Bruce, Fr Brian Maher is in a more contemplative phase of his ministry these days. However it hasn’t stopped him from accumulating another accolade. He was recently presented with an award of merit by the Federation of Australian Historical Societies. His latest award comes after he received an Order of Australia Medal in 2009. Associate Professor, Don Garden, the national president of the federation, travelled from Melbourne to make the presentation. The recipient is widely known for written his works on Archdiocesan history, much of which is detailed in his books, Planting the Celtic Cross and A Slice of Tipperary. Brendan O Caoliai, Ambassador of the Republic of Ireland, was a special guest at the presentation. He equally acknowledged the breadth of Fr Maher’s work which concentrates largely on the significance of the Irish Catholic communities that settled in and around the Archdiocese. Dr Richard Reid, Vice President of the Canberra and District Historical Society, and a significant colleague with Fr Maher in the conduct of the Shamrock in the Bush events at the Redemptorist Monastery, Galong, and fellow researcher in Irish history was present for the occasion. 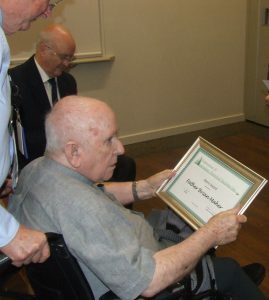 In response to receiving his award, Fr Maher, thanked the many people who he says have helped him publicly and privately with his historical work over a long period of time.